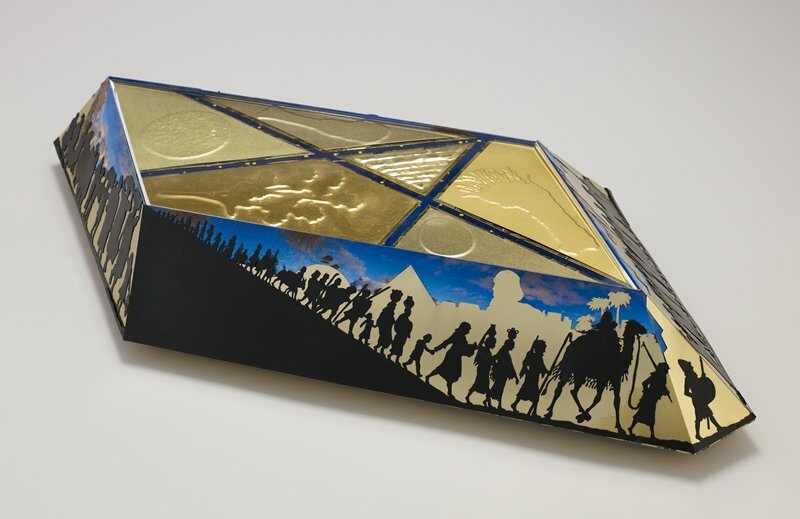 Constructed from recycled tin cans, this plate for the Passover Seder dinner commemorates Jewish emigration over thousands of years. The narrative begins with the original exodus from Egypt and continues with images of Jews over the centuries in the places they have lived. The final scene depicts African refugees in the twenty-first century fleeing the violence in Darfur. The top of the Seder plate features embossed images of traditional Passover foods, but with the addition of an orange. An orange is out of place on a Seder plate, but has become a symbol of support for including women, gays and lesbians as full-fledged participants in Jewish ritual.